Admittedly, I'm fascinated with bridges. Bridges of all sorts. The architecture of them... the expanse of them... the massiveness of them... really, everything about them. So, I try to take photos of interesting bridges I come across... no pun intended. It's not always that easy. Typically bridges are spanning water which means one can't necessarily get out of the car just anywhere to get a clear view for a photograph. 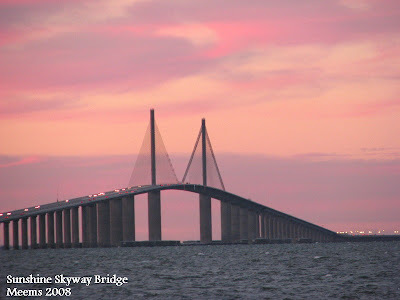 As part of the Interstate system the Sunshine Skyway Bridge links Pinellas County to Manatee County. If ever we are traveling south we will go out of our way to include crossing the bridge on our commute. 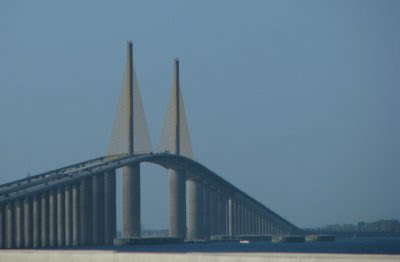 There's something about the approach to the bridge from the Pinellas side especially. 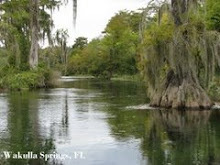 All at once water and sunshine and palm trees and birds come into view with that salty flavor in the air that speaks of every thing having to do with the Gulf Coast. It's freedom. It's exhilerating. It's Florida! SOOOOO, the photos viewed here so far were all taken while we were driving. Well, not me, silly. I was in the passenger seat. NOTE: The following photos of the older bridges and the history of the bridge I adapted from a website that assisted in the demolition of the old bridge. 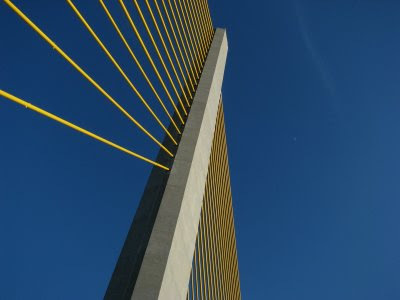 The first SUNSHINE SKYWAY bridge span opened in 1954, the 15 mile long crossing ran from St. Petersburg to Bradenton and had lengthy approach causeways on both sides, leading to a steep cantilever-truss crossing above the Tampa Bay ship channel. 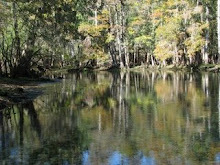 The vertical clearance for the channel was approximately 150 feet above the water and approximately 750 feet in width. 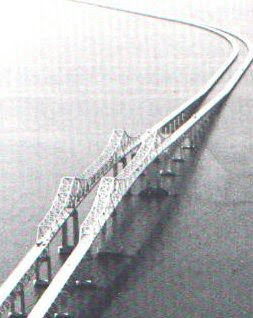 Increasing traffic across the two-lane span spurred the construction of a second parellel span which was completed in 1971, giving the bridges two lanes in each direction. On that fateful morning of May 9th,1980 at 07:38 , during a violent rain squall producing high winds and almost zero visibility the empty phosphate freighter SUMMIT VENTURE piloted by Captain John Lerro slammed into the #2 South pier ( over 700 feet from the center of the channel ) of the southbound (1970) span , it knocked 1261 feet of center span, cantilever , approach and roadway into Tampa Bay. Thirty-five people , most of them on board a Greyhound bus bound for Miami plunged 150 feet to their deaths in what is now one of the worst bridge disasters in history. 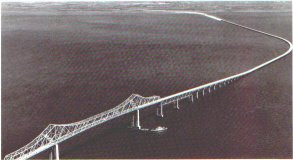 Rescue crews and divers were immediately dispatched to the scene, but of the victims who made the fall there was only one survivor , whose truck had luckily landed on the deck of the SUMMIT VENTURE After the fatal accident, traffic was rerouted onto the two-lane northbound span, until the planning and completion of the new SUNSHINE BRIDGE which opened in April of 1987. The old part of the bridge (also taken from the passenger's seat) that remains is now used as a fishing pier and managed by the state parks department. 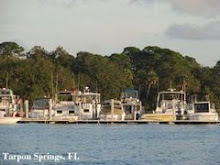 The South Fishing Pier is the longest Fishing Pier in the world. 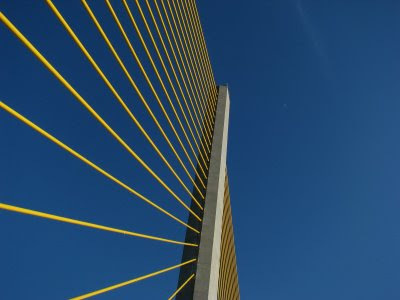 The new "cable-stay" bridge is a truly beautiful structure, at a cost of 245 million dollars it has a main span of 1200 feet and a vertical clearance of 193 feet. 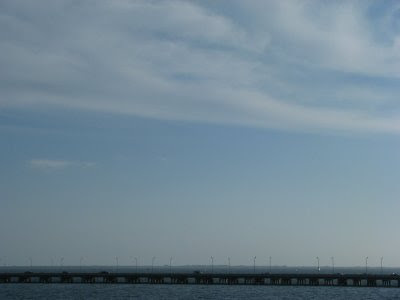 It is equipped with a bridge protection system involving 36 large concrete bumpers called dolphins that are built to withstand an impact from any errant ships in the vicinity of the bridges piers. Unlike most "cable-stay" bridges the new bridge uses a single plane of cables and the deck, made of prestressed concrete segments serves as structure as well as being the roadway surface. Hey, reckon great minds DO think alike. I'm just now working on a post about this bridge, as well. 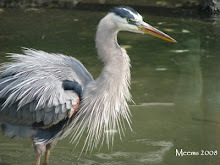 (Yes, I skip around my blog list while I'm posting.) Your pics are GREAT! So, when you do, you have to call me too becuase you were on my island when you got off the south end of the bridge! You can have your picnic at my house! 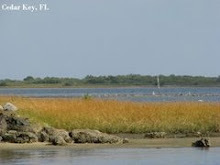 And for some reason I pictured Cathy to be up on the Nature Coast... where are you? On Anna Maria? Yes, we could all get together... just let me know when you're coming, Sophie. LOL, yeah, I can do lunch with the best of 'em. The patience I need to learn has to do with not snapping too quickly. I'm constantly reminding myself to pay attention to framing the shot and not squeezing the trigger too fast. Three for lunch sound fabulous! I'm not sure when I'll be able to get back down that way, but I'll for sure let y'all know. 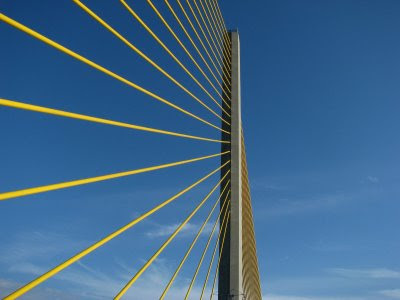 I love the beauty of the Skyway,and love to photograph it,but there is absolutely no way I'm going over it!I remember you-know-what. Sophie, we could all use a little patience on that order. Keep saving your pennies... let us know when you're heading this way. Chris and Jon... I DO remember but it doesn't bother me since it's been rebuilt. It is a beauty isn't it? your photos are great! the yellow cable shots and that last one with an amazing sky as the background. loved having all the info on this incredible bridge. it is hard to capture these shots. i would have a hard time with the height of it trying to lean out and take the shot. i have crossed the old and new so many times yet it still fascinates me everytime. such a beautiful structure! 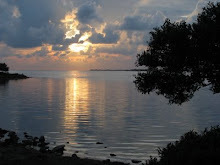 it rises like a giant sailing vessel across our bay, and gives such a distinct landmark to our gulf coast area. you captured some great images too! 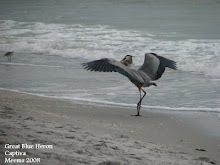 i have taken photos of it from Fort Desoto beach, and it is not easy to get the essence of such a massive bridge. it takes a better camera than i have had. but your pics are marvelous - almost like being there. 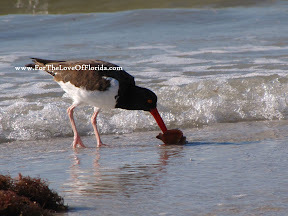 i am really liking this new blog about my favorite state! 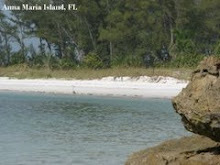 Gigi, I've taken some photos from the Anna Maria side, too but they were so far in the distance. I haven't been able to get a really clear shot from that vantage point. I hadn't thought about Ft. DeSoto. It really can be seen from a far piece away... It does look like sails on a ship, too. 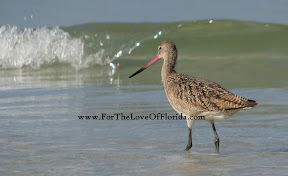 I'm glad you like this Florida blog... we do have a beautiful place to live! This bridge is awesome. Although you did a great job of capturing it, the beauty of it really cannot be totally appreciated until it is seen in person. Great post!